Helen Bartram, in Los Angeles to work on a screenplay, just saw her daughter Laura. But that’s impossible: Laura died nine years ago. She must be mistaken. But she knows she isn’t. Her husband Benny wouldn’t be surprised. Benny thinks that this is just one of an infinity of parallel universes, and that synchronicities, ghosts, prophetic dreams, are rents in the curtain, glimpses of other worlds. Things might have been different and, in some other place, they are. Helen is sceptical. But what else can explain her sighting? And now, when she most needs him, Benny isn’t here. He’s had enough of this world and Helen has no access to any other. 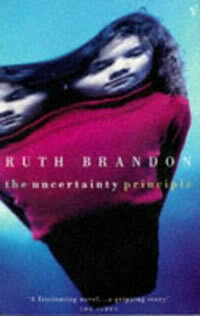 The Uncertainty Principle follows Helen’s search for her lost daughter across two continents and thirty years. Benny, the unreconstructed Darwinist, becomes a guru at the further reach of New Age physics. Their friend Colette, the beautiful film-star, must face the sad realities of middle age. Patrick, the golden boy of their youth, runs away: to London, to Brazil, to Los Angeles. From what? And meanwhile, what happens to the children? All these lives, so well-ordered when viewed from outside, zigzag in reality from chance to random chance. Everything seems so solid: but when you come to test the ground, it shifts beneath your feet… Helen finds that, in life as in physics, the Uncertainty Principle rules. This entry was posted on Sunday, March 21st, 2010 at 2:25 pm	and is filed under Fiction. You can follow any comments to this entry through the RSS 2.0 feed. Responses are currently closed, but you can trackback from your own site.